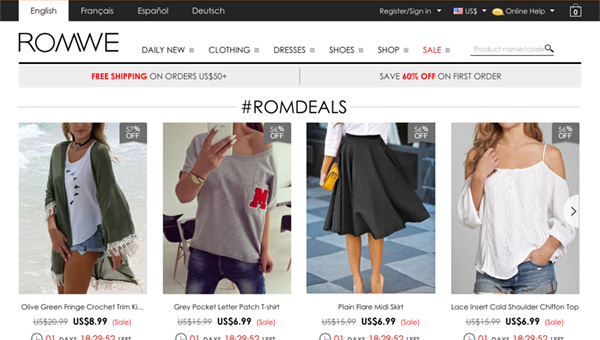 Romwe - a Chinese online clothing shop, which was founded in Nanjing in 2009. It sells affordable women's clothing, shoes and accessories. The customers can find here a huge range of the latest fashion trends, mainly high-quality fakes of clothes of the known European brand clothing stores. In addition to the fact that clothes on the website are low cost, they also do not yield to the brands in quality. If you want to look fashionable and stylish for little money, then you should try it. A special program is suggested for fashion bloggers, the details you can find directly on the website. Prices are not the cheapest, but the quality of fabrics and tailoring is at a very high level. Payment can be made either by credit card or by PayPal. Shipping for purchases exceeding $50 is free. If the order amount is less than $50 - the amount of delivery will depend on the distance and weight. Great company, fast response and also they send me a gift. Thanks!